When we were kids we called them BUMPERS not knowing their proper name: FENDERS. Fenders come in many shapes and sizes to do a variety of different jobs. Mainly, a fender should protect our boat’s hull from rubbing up against a harder and potentially damaging surface. Simple, right? Using a fender on a floating dock is fairly common and we’ve seen this on a previous video in our Docking Tips. But all docks are not floating and in the video below we show you how to best use fenders in a fixed dock situation. BTW a fixed dock is usually made of wood and pilings although we sometimes see concrete which is even tougher on your hull. A fenderboard also comes in many sizes and even different materials. In fact, most all those we have seen are homemade from wood with consideration for where you will stow it aboard your boat when it is not in use. The concept is simple. 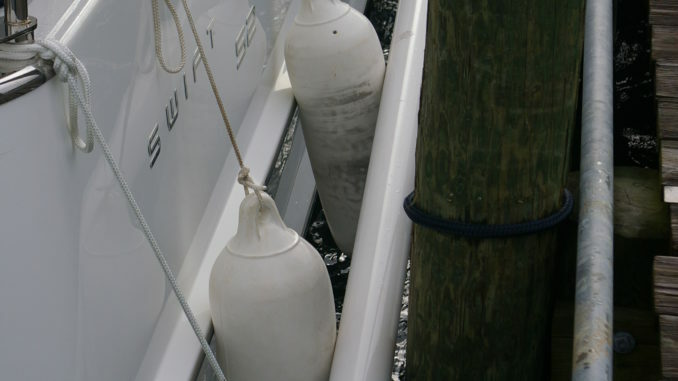 Place two or more barrel fenders against your hull and secured to your boat. 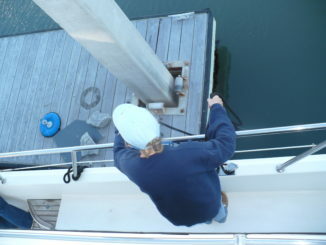 Next, take a board of the appropriate length to straddle the piling that protrudes out from the dock or pier. The board should have one hole on each end to insert a line and then tie each line securely to your boat. The fenderboard will lie against the piling and the fenders will protect your boat from the board and the piling. 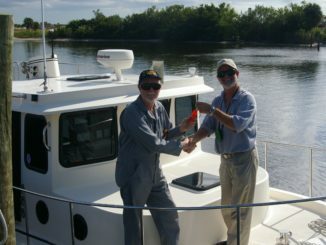 Your boat will move forward and aft and up and down with wind and tide. Because of this movement you need a larger area of contact to protect your boat. Plain old barrel fenders without the fenderboards will not stay in the right place against your hull. 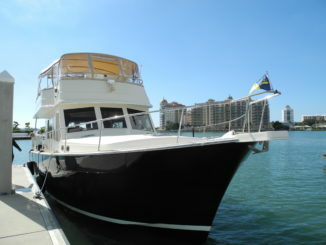 One of our clients did not care for the bare wood look and preferred PVC to match his more modern boat. Be careful to use a strong enough material whether wood, PVC or something else we have not thought of yet. The photo shows the finished PVC fenderboard with end caps to dress it up. Fortunately, this boat has space in the engine room to store two. Stay tuned for our next email tomorrow Perfect Docking – No Jumping Please. After receiving all five Docking Tips if you’d like more details, consider ordering our 60 minute Docking Video….or Ask Captain Chris!